Do you ever worry? Ridiculous question, right? Of course you do. It seems that all humans worry although there surely must be someone, somewhere, who doesn’t. But here’s the REAL question: is worry an inevitable part of the human condition or is it just a habit. Because if you can believe this Abraham Hicks quote – and I’m sure we can – then worrying, stewing and fretting are all habits that degrade our lives. What is worry, anyway? It’s the anticipation of future pain. And when we think about it that way, worry is just plain stupid. After all, what does it accomplish except to drive us stark raving nuts. Sometimes it might drive us to action but usually (almost always) worry-generated action makes things worse, or, at best, doesn’t solve the problem. 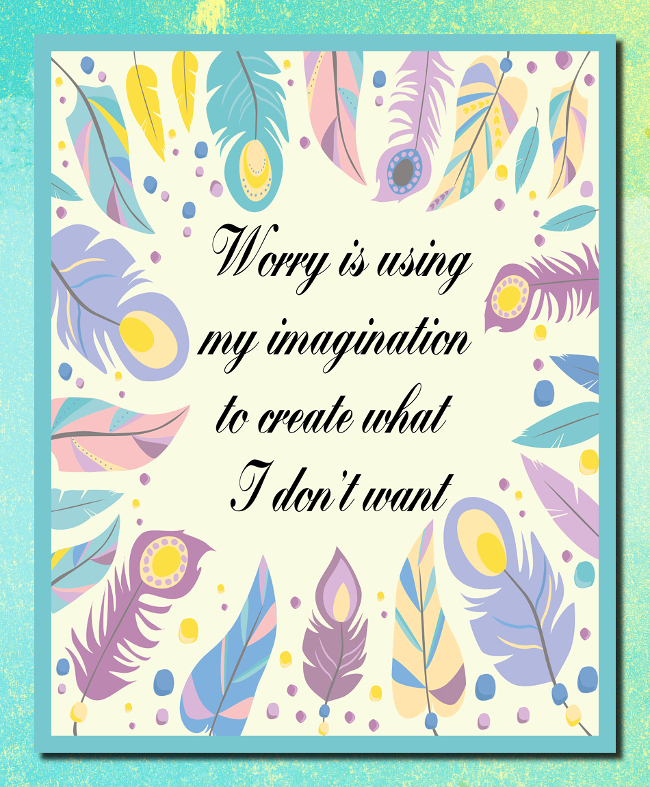 But Esther Hicks says that it’s even worse because considering the universal Law of Attraction, worry is dwelling on the negative which is simply inviting more of it into our lives. The first step is seeing how useless it is. That really isn’t so hard if we look at it objectively. Next time you’re sitting around chewing your nails, ask yourself if you’re accomplishing anything constructive. Most likely you’ll admit that you’re not. Once you see the futility of this damaging habit, let it go. To do this you need reminders which is why we made the the print above. I have it everywhere, like hanging right by my computer, in the kitchen and bathroom and on my tablet. When I realize I’m indulging – yes, that IS the right word – I put my attention on my breathing and just allow it to go away. And you know what the secret is? Practice, practice and more practice. But darned if it isn’t a really worthwhile skill to learn. When we were babies we didn’t worry which proves that it’s a learned habit and anything we learn we can ‘unlearn’. I promise you this is a life-changing practice. So grab our Abraham Hicks quote, print it out now and get started.